As those who know me well would vouch, I’ve never been in this business for the technology. Yes I love my gadgets and shiny objects of desire as much as the next person, but neither they nor speeds’n’feeds nor software feature lists get me out of bed in the morning. It’s the possibilities for empowering real people to do real work in new, more productive and enjoyable ways that get my creative juices flowing and my backside out of bed at 5am in the morning. After 22 years or so of a career that has seen those real people shift from being asked to do their work on DOS-based word processors to primitive forms of groupware running on green screens, to graphical office suites, via Lotus Notes to powerful new forms of social collaboration technology often accessed via mobile devices, it’s become clear to me that what the world does not need is yet another technology that promises to revolutionise the workplace. We’ve had plenty of those over the years – some have seen success, far more have failed and disappeared without trace along the way. The issue is that for most of the population, the way that we work as individuals, teams and organisations has fundamentally stayed remarkably consistent over the last couple of decades. We’re still asked to report to the office between 9 and 5 each day, we’re still expected to be at our desks for vast tracts of time working independently on our own curated lists of tasks and actions, to participate in regularly scheduled review meetings that seem to go on for ever without any work actually being done, whilst trying to ensure that our efforts and achievements are recognised by the line manager that we only see a few times a year and yet holds all the power when it becomes time for that annual review and pay discussion! Yes, this is possibly an overly negative perspective – hopefully not all the above is representative of your own situation, but I would imagine that there is more than a grain of truth to at least one of two aspects of the paragraph above in most workplaces. I’ve been giving a great deal of thought to the ‘Future of Work‘ in recent months, to what it means to be a knowledge worker within an organisation in 2014, and how that might change as we look forward through this decade to 2020 and beyond. The rise of social, mobile and cloud technologies in recent years should mean that the workplace of 2020 will look and operate very differently to those that we are familiar with today. Clearly the technology of now and the future will change how it appears, but that’s not what I think is important. After all, we’ve been predicting self-driving cars, robot assistants and the like for decades (and that is exciting), but if the fundamental way in which live and work does not evolve for the better then there is little point to the innovations in technology. What I (and many others) are looking for is a radical departure in the manner in which organisations are organised, leaders operate, teams collaborate and employees work and live. Technologies come and go, but if a CEO still operates as if in an ivory tower, delivering read-only strategy documents via a corporate hierarchy dominated by middle-aged grey-haired men, emailed out to thousands of employees to be stored for eternity in folders that will be looked at, refusing to be held accountable (or indeed accessible) to their employees/partners/customers then we are no further forward. I will strive to build and maintain good relationships with all. If I break a promise or ‘drop the ball’ with my commitments, I will front up and be accountable and I will work to put things right. No excuses, no blaming, no avoiding, no sweeping under the carpet. No wriggling out of embarrassing conversations or trying to change the subject. I will endeavour to be real with people; no obfuscation, no power games. I will strive to develop myself: this means becoming more self-reflective and more open to others’ feedback about me. In the realm of the networked workplace, I will trust you when I feel that you value my contributions and that you encourage others to do the same. I will trust you when you are constant. A psychologist friend of mine had a mantra which went, “The best predictor of future behaviour is past behaviour.” While I don’t agree with that entirely , there is some truth in it. 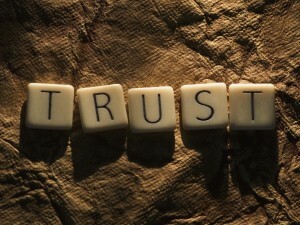 My trust in you will build over time, when you are repeatedly and consistently authentic and trustWORTHY. We will not necessarily gain trust in each other simply because we have played some simplistic ‘trust games’ during our one and only staff training day. Trust is one of the guiding principles of an Open Business – trust in one another, trust in our leaders and trust in the organisation. Do you trust the people you work with? Can they trust you? If not, isn’t it about time that we fixed this?